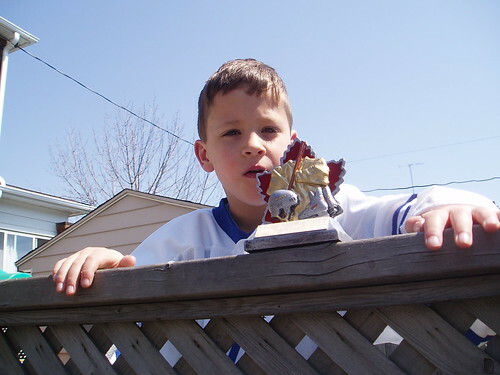 At the Swansea Hockey Association banquet today, James received his first trophy. Sure, it was a participation trophy, but it was still a trophy. He was very proud. His Dad, rushing to get him to the banquet after swimming lessons, almost dropped him off at the wrong place. I had it in my head that he was to be at the Swansea Town Hall at 11am, but a kindly old gentleman there suggested I head over to the Legion instead. Then, when I walked James into the Legion hall, it all came back to me. 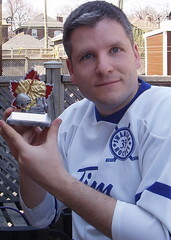 It was the same room in which I received my one and only non-participation hockey trophy. I was playing for Sam's Auto Repairs and they were announcing the winner of the Most Improved Player award. Not in my wildest dreams did I expect to hear my name called, but that's exactly what happened. I made my way up on to the stage to receive my MIP trophy in front of the entire league and I remember thinking that maybe I wasn't as bad as I thought I was. 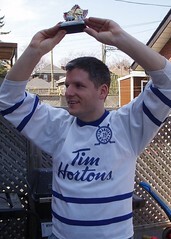 We had a little fun with James' first trophy where I relived that moment by putting on his jersey and hoisting his trophy. It's fun reliving your good memories though your kids. Nice trophy daddy-o. I can make out the hockey stick, helmet & skates on the maple leaf but what's the golden putty looking thing in the middle?